On Sunday, the final six players from a 621-entry field returned to the Rio All-Suite Hotel & Casino to play down to a winner in the 2018 World Series of Poker Event #58: $5,000 No-Limit Hold'em Six-Handed. Before entering the tournament, Jean-Robert Bellande sent out a tweet. "All this talk of me trying to finally get my 1st bracelet is a bit of a monkey on my back," the former Survivor contestant said. "I'm just gonna keep having fun and making outrageous calls." Bellande, who had previously finished runner-up in two WSOP events, managed to get that monkey off his back in what was his 24th WSOP-related cash. 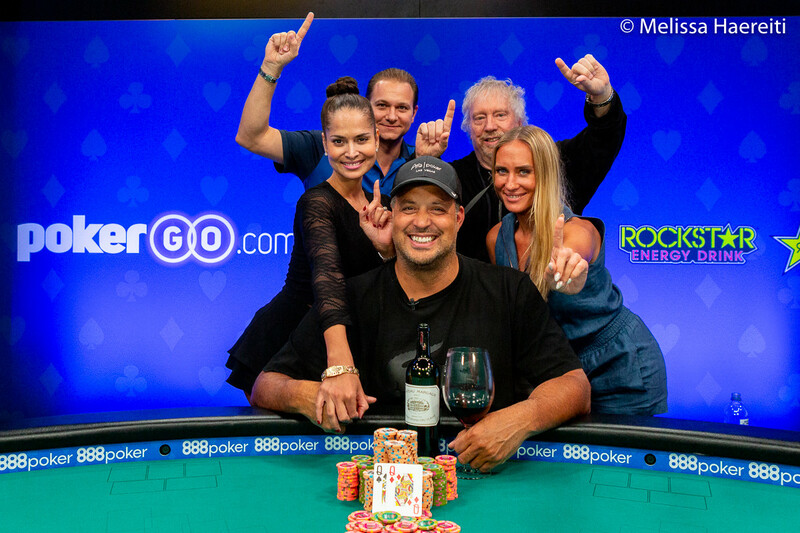 "Winning a bracelet in no-limit hold'em is an extra big surprise to me because it's not my best game," said Bellande, who sipped on a $400 bottle of Chateau Margaux 2013 Premier Grand Cru Classé while he played. "I've worked a lot on my game but I know I'm way behind the top-level players in that game. I would never ever dream my first bracelet would be in no-limit hold'em, but it makes it extra exciting for me." He continued: "I had a blast. I had so much fun during this tournament, not just winning but mixing it up. Six-handed is cool because you're always in action. The guys were all fun. We just had a good time. Every day we just had a blast." On Hand #10 of the final table, Poland's Kacper Pyzara ran an unsuccessful bluff against Dean Lyall to lose most of his chips. Two hands later, Pyzara jammed for 515,000 holding ace-seven in the small blind and Bellande woke up with jacks in the big. Pyzara found a seven on the flop but no other help was forthcoming. He had to settle for sixth place and an $85,570 payday. Two hands later, Eric Blair followed him out the door in fifth. It happened when both he and Andrew Graham flopped a pair of aces. They got it in when the turned paired eights, but Blair had a kicker problem as Lyall had a lady accompanying his bullet. The river was a brick and just like that Blair was gone, good for $120,699 in prize money. On Hand #26 of the final table, Tay Nguyen shoved his extreme short stack from the button with pocket eights and Bellande called from the small blind with jacks. The board ran out clean and Nguyen was ousted in fourth place for $173,598. The three-handed battle was a marathon and it wouldn't be until Hand #136 that Graham would bow out. It happened when Bellande raised to 400K with king-deuce and called Graham's 880K shove with jack-nine. Graham flopped an open-ended straight draw but missed when the turn and river came running fives. Heads-up play began with Bellande holding a 2-1 chip lead over Lyall but the two would engage in a back-and-forth match. Each took turns holding the chip lead on several occasions, but eventually, Bellande won eight hands in a row to once again pull out to a big lead. In the final hand of the tournament, which was Hand #228 of the final table, Lyall moved all in with ace-three offsuit and Bellande woke up with pocket queens. Lyall paired his three on the flop but that was all the help he got as both the turn and river ran out in Bellande's favor. "At one point he had a 3-1 chip lead and I thought it was curtains, and then I caught a nice little rush," Bellande reflected. "Really happy, really relieved. First bracelet after two second places. My first time I was a 19-1 chip lead and I lost that bracelet, that was just devastating. Tonight, it looked like I was going to squander a 2-1 chip lead and lose it again. It's a relief, it's exciting. The $600,000 is also exciting." Hand #228: Just like the entire match, the last hand was a quick one as well. Dean Lyall open-shoved the button for 4.36 million and Jean-Robert Bellande called. Neither came as the hit the turn and hit the river. Jean-Robert Bellande had his arms in the air and high-fived his supporters on the rail. Moments later, Bellande and Lyall shook hands. "Hell of a match man," Bellande told Lyall. Hand #218: Jean-Robert Bellande limped and Dean Lyall checked his option to see a flop, which both players checked. Action repeated on the turn and Lyall checked the river. Bellande bet 500,000 and Lyall folded. Hand #219: Lyall called and Bellande checked his option to see a flop. Both players checked and the dealer burned and turned the . Bellande bet 300,000 and Lyall folded. Hand #220: Bellande limped and Lyall checked his option. The flop came down and Lyall checked to Bellande, who bet 240,000. Lyall called and then checked the turn. Bellande bet 500,000 and Lyall called before checking for the third time on the river. Bellande bet 1.5 million and Lyall called. Bellande tabled for a straight and it was good. Hand #221: Lyall gave Bellande a walk in the big blind. Hand #222: Bellande limped, Lyall raised to 750,000, and Bellande jammed. Lyall folded. Hand #223: Lyall limped the button and Bellande checked his option to bring out the flop. Both players checked as they did on the turn. Bellande bet 240,000 on the river and Lyall folded. Hand #224: Bellande limped, Lyall checked his option, and the flop came down . Both players checked and did the same on the turn. 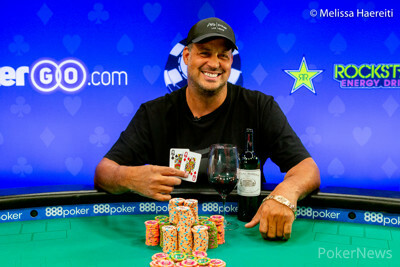 Lyal check-called a bet of 300,000 on the river and Bellande tabled an ace to win his seventh hand in a row. Hand #225: Lyall limped, Bellande checked his option, and the flop came out . Both players checked and did the same on the turn. When the completed the board on the river, Bellande bet 800,000 and Lyall folded. Hand #226: Bellande limped and Lyall checked his option to see a flop. Lyall checked and Bellande bet 250,000. Lyall called and then checked the turn. Bellande checked behind and the completed the board on the river. Lyall bet 1.5 million and Bellande folded to end his winning streak at eight hands in a row. Hand #209: Dean Lyall folded the button, giving the pot to Jean-Robert Bellande. Hand #210: Bellande opened to 480,000 and Lyall called. Lyall check-folded to a bet of 500,000 on . Hand #211: Lyall folded, a walk for Bellande. Hand #212: Bellande limped in and Lyall checked. Lyall checked on and Bellande bet 300,000. Lyall check-raised to 730,000 and Bellande called. Both checked the on the turn before Lyall bet 1.2 million on the river. Bellande folded. Hand #213: Lyall opened for 500,000 and Lyall folded. Hand #214: Bellande open folded his . Hand #215: Lyall folded, Bellande showed . Hand #216: Bellande limped in and Lyall checked. Both checked on as well and the on the turn paired the board. Lyall check-called 300,000 and the saw both players check. Lyall tabled and Bellande mucked. Hand #217: Lyall opened for 500,000 and Bellande called. Bellande check-called 560,000 on and check-called another 750,000 on the turn. The river saw both players check and Bellande showed the winner with . Lyall flashed a queen before he mucked. Hand #195: Dean Lyall raised the button to 420,000 and Jean-Robert Bellande called to see the . Both players checked and then Bellande bet 300,000 on the turn. Lyall called and the completed the board on the river. Both players checked the straight on board and chopped the pot. Hand #196: Bellande raised to 400,000, Lyall called, and the flop came down . Lyall check-folded to a bet of 300,000. Hand #197: Lyall raised to 420,000 and Bellande folded. Hand #198: Bellande raised to 400,000, Lyall called, and the flop came down . Lyall checked, Bellande bet 400,000, and Lyall called. The dealer then burned and turned the and both players checked to the . Lyall bet 1.6 million and Bellande folded. Hand #199: Lyall raised to 420,000 and Bellande folded. Hand #200: Bellande raised to 400,000 and Lyall moved all in. Bellande folded. Hand #201: Lyall raised to 420,000 and Bellande folded. Hand #202: Bellande raised the button to 400,000 and Lyall called to see a flop. Lyall checked and then folded when Bellande bet 400,000. Hand #203: Lyall raised to 420,000 and Bellande called to see the flop. Bellande check-folded to a bet of 215,000. Hand #204: Bellande raised the button to 400K and Lyall called. The flop saw Lyall check-fold to a bet of 200,000. Hand #205: Lyall limped the button and Bellande exercised his option with a raise to 700,000. Lyall called it and the duo went to the flop. Bellande bet 500,000 and Lyall released. Hand #206: Bellande raised to 400,000 and Lyall folded. Hand #207: Lyall raised to 420,000, Bellande called, and the flop came down . Both players checked and the appeared on the turn. Bellande bet 300,000 and Lyall folded. Hand #208: Bellande raised to 400,000, Lyall called, and the flop fell . Lyall checked, Bellande bet 400,000, and Lyall called to see the turn. Lyall seized the initiative y leading out for 290,000 and Bellande snap-folded. Hand #184: Jean-Robert Bellande raised to 400,000 and Dean Lyall called. Lyall check-called a bet of 500,000 on the flop but check-folded to Bellande's 1.4 million second bullet on the turn. Hand #185: Lyall raised to 420,000 and Bellande called. Bellande check-folded to a 300,000 bet on the flop. Hand #186: Bellande limped in but folded as soon as Lyall made it 585,000 to go. Hand #187: Lyall folded, giving Bellande a walk. Hand #188: Bellande made it 400,000 to go and Lyall called. Lyall checked on and called Bellande's 200,000 bet. Both players checked on the turn and the completed the board. Lyall bet 420,000 and Bellande folded. Hand #189: Lyall raised to 420,000 and Bellande called. Bellande checked on and Lyall bet 215,000. Bellande check-raised to 800,000 and Lyall instantly let it go. Hand #190: Bellande folded, pot to Lyall. Hand #191: Lyall raised to 420,000 but his cards hit the muck as soon as Bellande made it 1.2 million. Hand #192: Bellande opened for 400,000 and Lyall called. Lyall check-called 200,000 on before both of them checked the on the turn. The completed the board and Lyall bet 850,000. Bellande folded. Hand #193: Lyall raised to 420,000 and Bellande called. Bellande checked on and Lyall answered with a bet of 215,000. Bellande check-raised to 800,000 and Lyall folded. Hand #194: Bellande opened for 400,000 but folded to Lyall's 1.4 million three-bet. Hand #172: Jean-Robert Bellande raised to 400,000 and Dean Lyall folded. Hand #173: Lyall raised to 420,000 and Bellande called to see a flop. Bellande check-called a bet of 400,000 and then checked the turn. Lyall bet 1.05 million and Bellande called. When the completed the board on the river, Bellande checked and Lyall moved all in for 4.1 million. "Oh man, what a river," Bellande said as he turned his hat backward. "Dirty. Dirty. Dirty. Dirty." Bellande then let his hand go. Hand #174: Bellande raised to 400,000 and Lyall folded. Hand #175: Bellande received a walk. Hand #176: Bellande raised to 400,000 and folded when Lyall three-bet to 1.35 million. Hand #177: Lyall raised to 420,000 and Bellande called to see the flop. Bellande checked and folded when Lyall bet 215,000. Hand #178: Belland raised to 400,000 and Lyall called. The flop came down and Lyall checked to Bellande, who bet 600,000. Lyall called and the dealer burned and turned the . Both players checked and the completed the board on the river. Lyall bet 600,000 and Bellande paid it off. Lyall showed the but it was no good as Bellande held the . Hand #179: Lyall made it 420,000 to go and Bellande called to see the flop. Bellande checked, Lyall bet 235,000, and Bellande called. The latter then checked the turn and Lyall fired again, this time 425,000. That did the trick as Bellande folded. Hand #180: Bellande raised to 400,000 and Lyall folded. Hand #181: Lyall folded the button. Hand #182: Bellande raised to 400,000, Lyall called, and the flop came out . Lyall check-called a bet of 400,000 and then checked the turn. Bellande fired again, this time 900,000, and Lyall called. When the completed the board on the river, Lyall checked and Bellande did the same. Lyall tabled the and it was good as Bellande mucked. Hand #183: Lyall raised to 420,000 and Bellande called. On the flop, both players checked and the dealer put out the on the turn. Bellande bet 500,000, Lyall called, and the completed the board on the river. Bellande checked and folded when Lyall bet 850,000. Hand #163: Dean Lyall raised to 425,000 and Jean-Robert Bellande called. Bellande check-called 420,000 on and led out for 500,000 on the turn. The on the river had both players check and Bellande showed . Lyall tabled and took down the pot. Hand #164: Bellande raised to 400,000 and Lyall called. The flop came and Lyall check-called 200,000 but he check-folded to a 400,000 bet on the turn. "Good fold," Bellande said. "Good fold buddy, good fold." Hand #165: Lyall raised to 425,000 and Bellande called. Bellande check-folded to a 400,000 bet on the flop. Hand #166: Bellande took down the pot with a raise to 400,000. Hand #167: Lyall made it 420,000 and Bellande called. Bellande checked on and Lyall bet 225,000. Bellande check-raised to 725,000 and Lyall folded. Hand #168: Bellande made it 400,000 to go and Lyall called. Both checked on and the hit the turn. Lyall checked and folded to Bellande's 600,000 bet. Hand #169: Lyall raised to 420,000 and Bellande called. Bellande check-folded to a bet of 400,000 on . 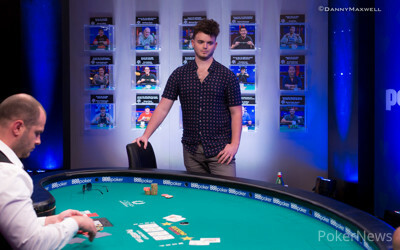 Hand #170: Bellande raised to 400,000 but folded as soon as Lyall raised to 1.15 million. Hand #171: Lyall made it 420,000 to go and Bellande folded. As has been the case the whole final table, the play is rapid and not once has anyone tanked for longer than a minute. Hand #153: Dean Lyall raised the button to 325,000 and Jean-Robert Bellande folded. Hand #154: Bellande raised the button to 400,000 and Lyall called to see a flop. Lyall checked and then folded when Bellande bet 300,000. Hand #155: Lyall raised to 325,000 from the button and Belland called. The flop fell and both players checked. Belland then bet 250,000 on the turn and Lyall called to see the river. Belland checked and Lyall bet 550,000. Belland folded. Hand #156: Bellande made it 325,000 to go and Lyall called. On the flop, Lyall check-called 250,000 and the dealer burned and turned the . Both players checked and the was run out on the river. Action went check-check and Lyall tabled the for tens and jacks. It was good as Bellande sent his hand to the muck. Hand #157: Lyall raised the button to 325,000 and Bellande called to see a flop. Bellande check-called a bet of 200,000 and then checked the turn. Lyall checked and the completed the board on the river. Both players checked and Bellande tabled the for a rivered pair of threes and the win. Hand #158: Bellande made it 325,000 to go on the button and Lyall called to see the flop. Lyall check-called a bet of 200,000 and the appeared on the turn. Both players checked and then did the same on the river. Lyall tabled the and it was good as Bellande mucked. Hand #159: Lyall raised to 325,000 and Bellande three-bet to 1 million. Lyall called and the two saw a flop of , which they both checked. The turn saw Bellande check for the second time and Lyall did the same to the river. Bellande bet 600,000 and Lyall called only to muck when his opponent tabled the for trip tens. Hand #160: Belland raised to 325,000 and Lyall called to see a flop. Lyall checked and folded when Belland bet 300,000. Hand #161: Lyall raised to 325,000, Bellande called, and the flop came out . Bellande checked and then folded when Lyall bet 215,000. Hand #162: Bellande made it 325,000 and Lyall called, which brought about a flop. Lyall checked, Bellande bet 250,000, and Lyall called to see the turn. Both players checked and did the same on the river. Lyall showed the but it was no good as Bellande held a pair with the . Hand #146: Jean-Robert Bellande raised to 325,000 and Dean Lyall called. Lyall check-called 300,000 on and another 800,000 on the turn. The on the river saw both players check and Lyall took it down with . Lyall took over the lead in the match with 8.2 million to Bellande's 7.3 million. Hand #147: Lyall limped in and Bellande checked. Bellande bet out 200,000 on and Lyall folded. Hand #148: Bellande raised to 325,000 and Lyall called. Lyall checked on and called Bellande's 275,000 bet. The on the turn went check-check and Lyall checked once more on the river. Bellande bet 700,000 and Lyall folded. Hand #149: Lyall opened for 325,000 and Bellande called. Bellande check-called 215,000 on before the turn was checked through. Bellande bet 405,000 on the river and Lyall folded. Hand #150: Bellande opened for 325,00 and Lyall called. The flop was checked by both before Lyall check-folded to a bet of 300,000 on the turn. Hand #151: Lyall raised to 325,000 and Bellande folded. Hand #152: Bellande raised to 325,000 and Bellande folded. Hand #143: Dean Lyall limped the button and Jean-Robert Bellande checked his option to see a flop, which they both checked. Bellande then bet 160,000 on the turn and Lyall called. When the completed the board on the river, Bellande checked and Lyall bet 420,000. Bellande snap-folded. Hand #144: Bellande raised to 325,000 and then folded when Lyall jammed all in. Hand #145: Lyall limped the button and Bellande raised to 660,000. Lyall called and the flop came down . Bellande checked, Lyall bet 390,000, and Bellande check-raised all in. Lyall called off for 2.33 million and the hands were turned up. Lyall was ahead with top pair and a gutshot while Bellande had a double gutter. The turn was of no consequence and neither was the river. Ship the double to Lyall. Hand #137: Dean Lyall opened the button to 325,000 but folded to Jean-Robert Bellande's three-bet to 1.1 million. Hand #138: Bellande opened to 325,000 but folded to Lyall's three-bet to 960,000. Hand #139: Lyall raised to 325,000 and Bellande called. Both players checked the flop and turn before the popped up on the river. Bellande checked and saw Lyall bet 420,000. Bellande check-raised to 1.6 million and Lyall folded. Hand #140: Bellande opened to 325,000 and Lyall called. Lyall check-called 200,000 on before they both checked the on the turn. The river came the and Lyall checked. Bellande bet 200,000 and Lyall called. Bellande showed and Lyall mucked. Hand #141: Lyall folded, giving Bellande a walk. Hand #142: Bellande opened for 325,000 and Lyall three-bet to 935,000 with 2.7 million behind. Bellande said: "OK, I play for it all," and Lyall instantly folded. Hand #136: Jean-Robert Bellande raised the button to 400,000 and called when Andrew Graham moved all in for 880K from the big blind. The flop didn't hit Graham directly but it did give him an up-and-down straight draw. Unfortunately for him, the running turn and river allowed Bellande's hand to hold up. Hand #128: Jean-Robert Bellande received a walk. Hand #129: Bellande limped the small blind and Dean Lyall checked his option from the big. The flop saw both players check and the appeared on the turn. Bellande check-called a bet of 200,000 and the completed the board on the river. Bellande checked and Lyall bet 550K. Bellande folded. Hand #130: Bellande raised the button to 350,000 and won the blinds and antes. Hand #131: Bellande received a walk in the big blind. Hand #132: Bellande raised to 525K from the small blind and Lyall called to see a flop. Bellande bet 300,000 and Lyall folded. Hand #133: Bellande raised the button to 400,000 and Lyall called out of the small blind. Andrew Graham folded from the big and the flop came out . Both players checked, the appeared on the turn, and Lyall bet 420,000. Bellande made a quick call and the paired the board on the river. Lyall bet 750,000 and Bellande quickly folded. Hand #134: Graham moved all in from the small blind and Bellande folded from the big. Hand #135: Bellande raised to 550,000 from the small blind and Lyall folded the big. The players return in 15 minutes. When play resumes, blinds will be 80,000 and 160,000 with a 20,000 ante. Hand #115: Jean-Robert Bellande opened the button for 350,000 and big blind Andrew Graham called. Graham check-folded to a bet of 250,000 on . Hand #116: Graham limped in from the small blind but folded to Bellande's big blind raise to 500,000. Hand #117: Small blind Bellande raised to 500,000 and big blind Dean Lyall folded. Hand #118: Bellande opened to 350,000 from the button but folded to big blind Graham's 1.7 million push. 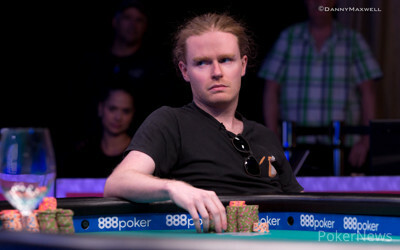 Hand #119: Lyall raised to 250,000 from the button and picked up the blinds and antes. Hand #120: Graham shoved from the button and both blinds folded. Hand #121: Bellande raised to 350,000 from the button but folded to Graham's big blind push. Hand #122: Lyall raised to 250,000 from the button and big blind Bellande called. Bellande check-folded to a bet of 175,000 on . Hand #123: Lyall got a walk in the big blind. Hand #124: Bellande picked up the blinds and antes with a raise to 275,000 from the button. Hand #125: Graham limped in from the small blind but folded to Bellande's 500,000 raise from the big blind. Hand #126: Bellande limped in from the small blind and Lyall checked the big blind. Bellande bet 100,000 out on and was corrected by the dealer to make it 120,000. Lyall raised to 360,000 and Bellande folded. Hand #127: Bellande opened the button for 350,000 and big blind Graham called. Both checked on and the hit the turn. Graham check-called 400,000 and he checked again once the completed the board. Bellande bet 425,000 and Graham, after thinking about it for a bit, called. Bellande showed and Graham did one last double check on his cards before he mucked.